The waters of Alaska provide a bounty of seafood. 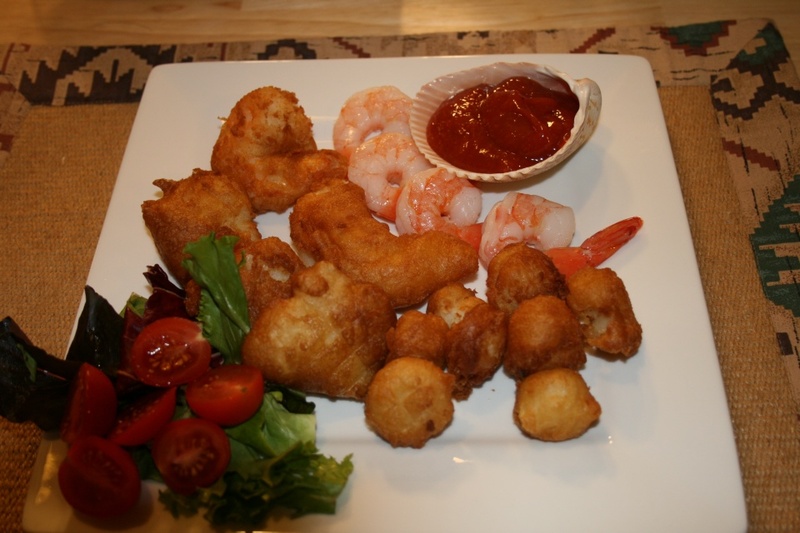 Halibut and shrimp are excellent choices for a beer battered seafood fish fry. At home a frying pan with an inch and a half of oil does very well. A deep fryer does even better, while the boys at the airport fire station use a turkey deep fryer out in back of the fire house (they take their fish fries seriously). This recipe is for a basic batter with baking powder for leavening and an egg for additional leavening and protein for binding. Beer provides the liquid and flavoring for the batter though I admit that I usually add a bit of paprika to the mix. In a pinch Bisquick or Crustease Pancake Mix can be used – a handy substitution while on camping trips – with very good results. Prepare seafood: Cut into bite-sized pieces. 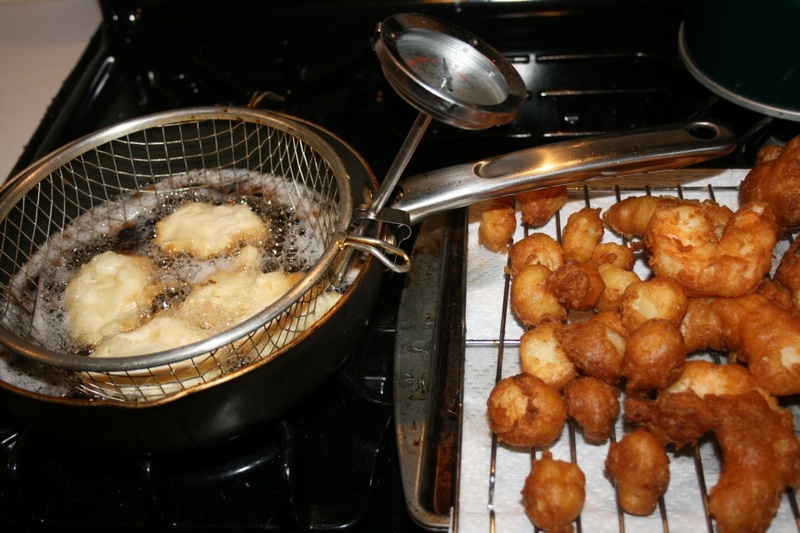 When cooking, the batter will turn golden brown and we take that to mean it is cooked through. With experience, we learn just how large to cut the pieces so they will be cooked through, to your liking, by the time the batter has browned. I cut the halibut into about one to one and a half-inch pieces and that seems to work most of the time. After cutting, rinse and drain. Pat dry with paper towels. Mix and sift dry batter ingredients (except the cornstarch) together. Place in a large bowl. Beat the egg and mix with ½ cup of cold, flat beer. Add to dry ingredients. Stir and mix, adding additional beer, until you have a smooth batter that resembles a runny pancake mix. You want to make a batter that will easily coat the seafood but not be too thick; that would make a puffy dough ball around the seafood and keep it from cooking through. Nor do you want to make it too thin and that would allow the seafood to overcook before the batter turned golden brown. Preheat the oil in a heavy pan or fryer to 350°. If cooking on the stove top, use a thermometer to obtain the proper temperature, increase the heat when adding seafood and then reduce the heat when the temperature returns to 350°. Place the cornstarch in a plastic bag. 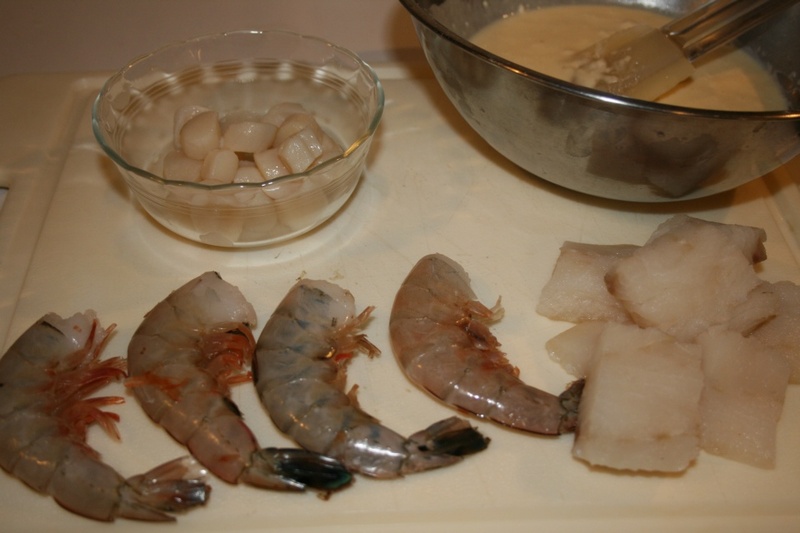 Add the seafood and shake to coat and dry the surfaces of the seafood. This will help the wet batter adhere to the seafood. Empty the seafood onto a rack so the excess cornstarch falls away. Dip each piece of seafood in the batter and tap of excess on the side of the bowl (that’s why the large bowl). Lower the coated seafood into the hot oil. Cook a few pieces at a time. Cook for about two minutes per side and turn or until a golden brown. Remove from the oil with a slotted spoon and drain on a rack. Serve with your favorite dipping sauce.